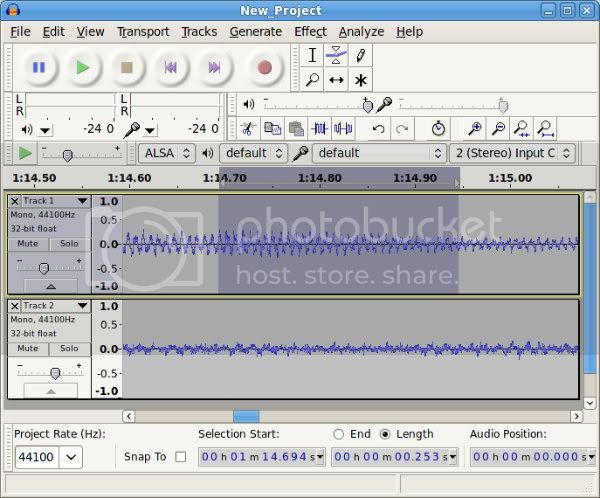 Audacity es un editor de audio libre, fácil de usar y multiplataforma. Convertir cintas y grabaciones a sonido digital o CD. Editar archivos Ogg Vorbis, MP3, WAV y AIFF. Cortar, copiar, unir y mezclar sonidos. Cambiar la velocidad o el tono de una grabación. * "Retain labels" Interface Preference did not retain labels for a region that snapped exactly to both label edges. * Projects did not save the track selected state. * (OS X, Linux) Timer Record: Interlinking of the Start, End and Duration controls was broken. * (Windows) JAWS screen-reader did not read the "Draw curves" and "Graphic EQ" radio buttons in Equalization correctly. * Exporting (or any render operation) on a track containing split lines could create clicks at the split lines. * Dragging a clip into another track caused a crash if Sync-Lock Tracks was enabled and there was also a label track. * Normalize could crash if the track name contained "%". * Duration controls when generating at a point now default to hh:mm:ss + milliseconds format. Selection Toolbar also defaults to that format on first installation or resetting preferences. * "Snap To" in Selection Toolbar now has an explanatory tooltip. * Device Toolbar tooltips now display the selected device. * Increased default width of Device Toolbar and Meter Toolbar. * Risset Drum (new "Amplitude" slider). * Importing a labels file writes the file name to the name of the Label Track, and exporting a labels file offers the name of the last Label Track in the project. * Removed the "Audio cache" option from Directories Preferences due to frequent crash reports. All data operations will now be written to disk and not to RAM. * Removed the FFmpeg "On-Demand" option from Libraries Preferences (this fixes Audacity not building if configured --without-ffmpeg). * Compilation: Progress on making the Modules feature mainstream. Modules can now be individually enabled and disabled in Preferences.